This craft uses simple supplies every children’s ministry probably has on hand. It is used to teach children about how Jesus is both the Lion and the Lamb. It can be spread out over two lessons or be combined into one. Time Needed: 30 minutes for craft alone depending upon how much the teacher preps ahead of time and how many adults helpers you have. Pass out the strips of yellow construction paper and one marker, pencil, or crayon to each child. Each child will roll the strips of paper one at a time around their marker, pencil, or crayon to make a curl. Pass out one paper plate and glue to each child. 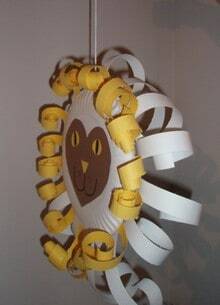 Each child will glue their yellow curls around the edge of the paper plate to make the lion’s mane. Pass out one brown (6×6 inch) square to each child. 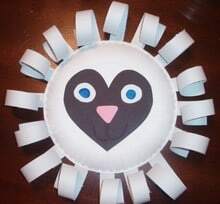 Each child will cut a large heart out of their paper to make the face of the lion. Pass out one scrap of yellow paper to each child. They will use the paper to cut out eyes and a nose for the lion’s face. They will glue the eyes and nose to the lion’s heart shaped face. Pass out a black crayon to each child. 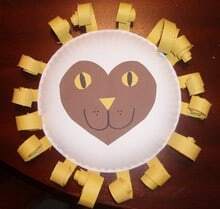 They will use the black crayon to add details to the lion’s eyes and mouth and then glue the lion’s face onto the back of the paper plate. Pass out the strips of white construction paper and one marker, pencil, or crayon to each child. Each child will roll the strips of paper one at a time around their marker, pencil, or crayon to make a curl. Pass out the second paper plate and glue to each child. Each child will glue their white curls around the edge of the paper plate to make the lamb’s wool. Pass out one black (6×6 inch) square to each child. Each child will cut a large heart out of their paper to make the face of the lamb. Pass out one scrap of white paper and one scrap of pink paper to each child. They will use the white paper to cut out the lamb’s eyes. They will use the pink paper to cut out the lamb’s nose. Then both eyes and the nose will be glued to the lamb’s heart shaped face. Pass out a blue crayon and white crayon to each child. They will then color blue eyes for the lamb and use the white crayon to draw on the lamb’s mouth. Finally, the child will glue the lamb’s face onto the back of the paper plate. 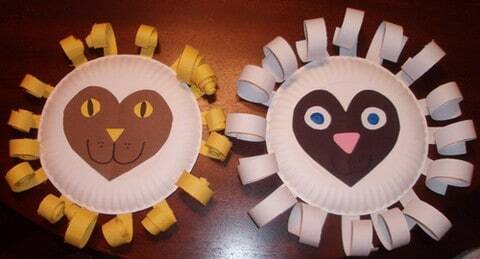 Give each child a length of yarn to glue or tape to the top of their lion plate or lamb plate. An adult helper will use a stapler to staple the lion and the lamb plates together so each face is pointing outward. The lion and the lamb can then be hung from the ceiling of the classroom or taken home with each child to be hung at home. If desired, you could use wiggly eyes and pom-poms for the lion and lamb’s eyes and nose. Using a pencil or crayon to wrap the strips of paper will make tight curls and using a maker to wrap will make looser curls. If you choose you may stuff each craft with newspaper before stapling together, but this is not necessary. I like using a heart shape for the faces as another reminder for the children of how Jesus is love. Even in his kingly rule as the lion and his sacrificial act as the lamb, He is always love. Tony Kummer (Editor) reviewed & updated this page on : June 8, 2015 at 10:05 pm. All our content is peer reviewed by our readers, simply leave a comment on any post suggest an update.